Color as object is earthly material stuff. Color as subject arches over everything like a rainbow, from cosmic rays to the minerals in the earth to what happens inside your eyes, from religious symbology to philosophical problems, from phenomena to noumena. 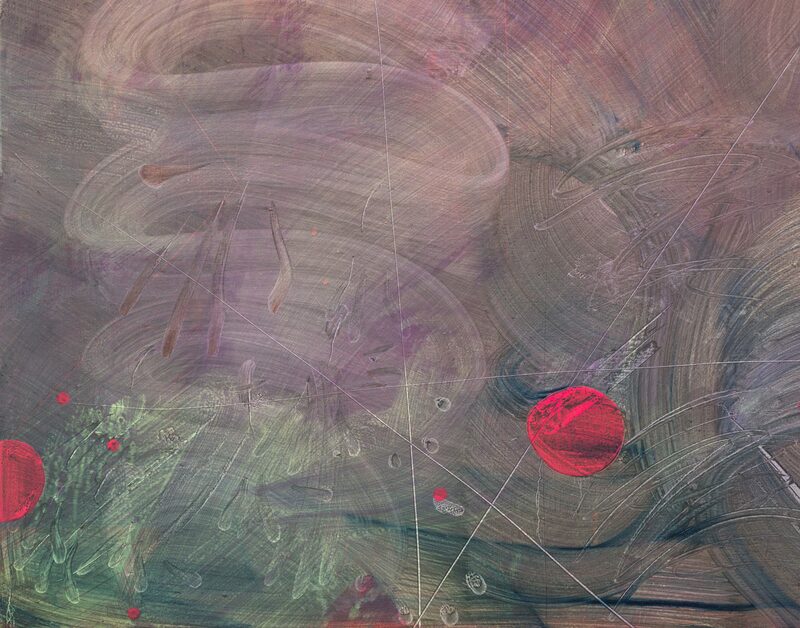 But aside from all that, color is just the tool that a painter wields in making a painting. To deal with color as a painter is to render those overarching problems as physical propositions, as sensuous experiences synesthetically merged under the sign of the hand. 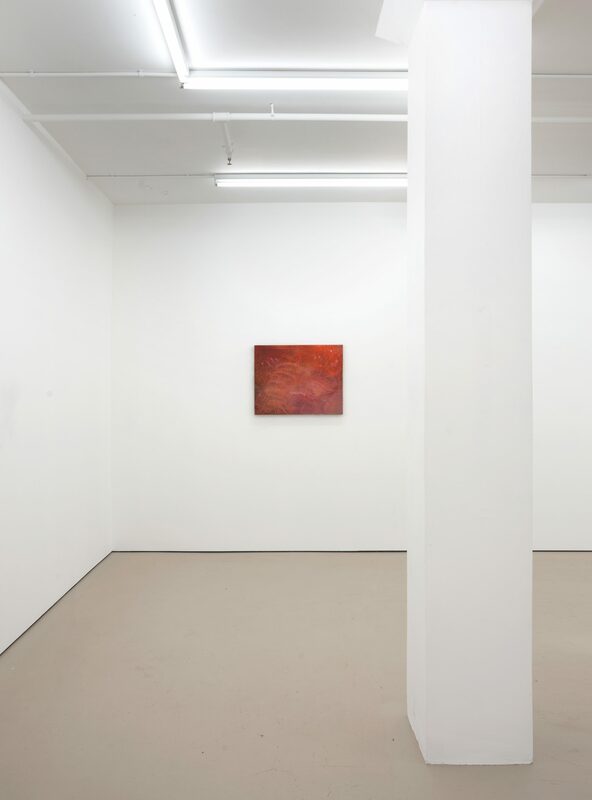 Hopkinson Mossman is pleased to present Rose on red, a solo exhibition of new paintings by Emma McIntyre. 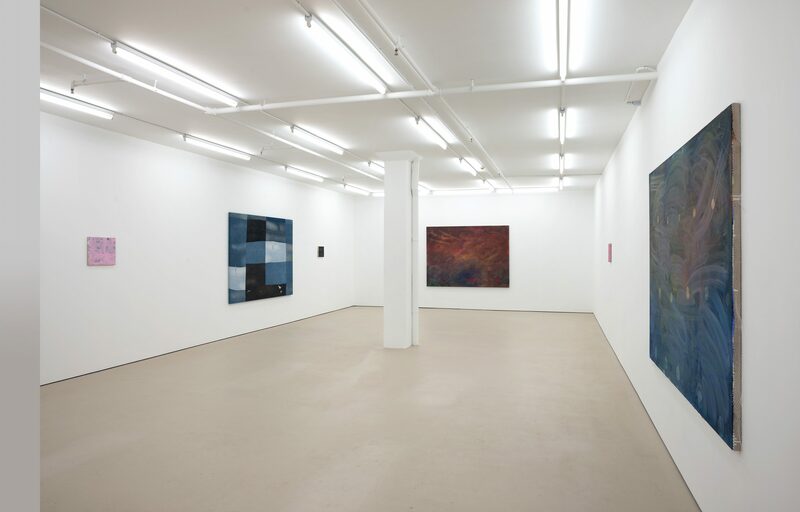 In Rose on red, paintings again feature grid structures (lattices, harlequin, chequerboard, etc.) as an orientating and destabilising force. 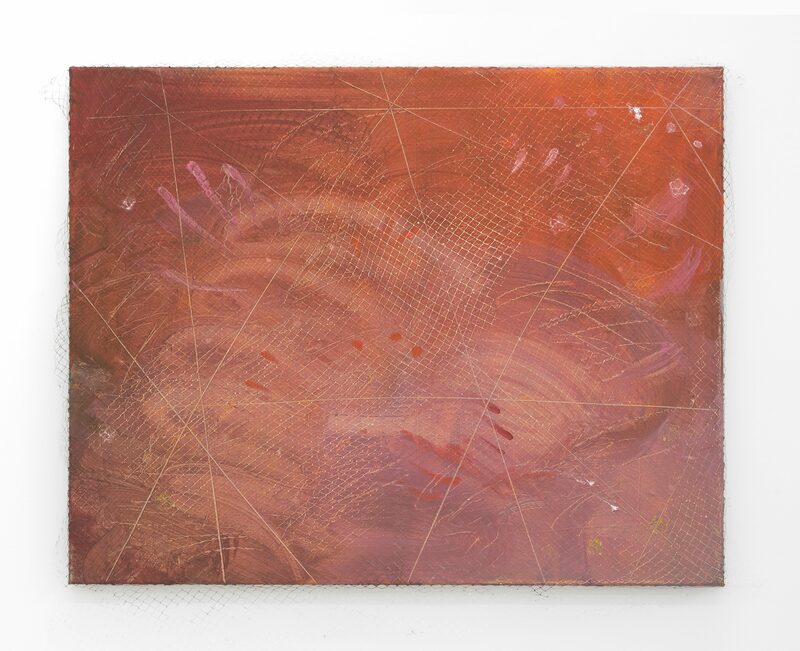 In some works, mesh is embedded into the painting’s base, creating a tight grid, its raised lines inversions of the scratched-in topmost grid. 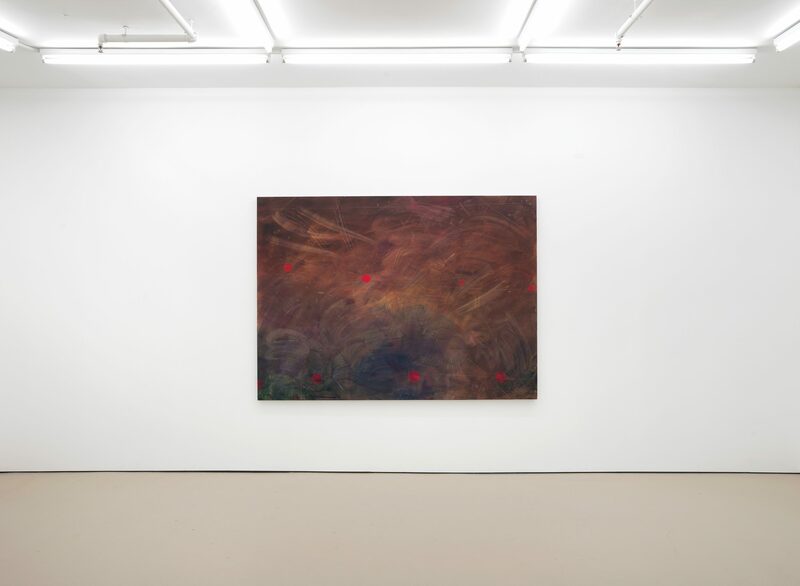 In other works, layers of larger loose grids create a sense of depth, opening up interstices in which lyrical swathes of colour conceal small impressions of a flower stamp, or scratches of fingernails. The finger mark, or more specifically scratches made by the artist’s fingernails, feature prominently in Rose on red. Sometimes a couple of loose flicks, at other times a looping all-over composition, the scratches are an unruly disruption of the picture plane. By using her fingers as a painting tool, instead of a foreign device, McIntyre favours direct contact between the skin, paint, and canvas. 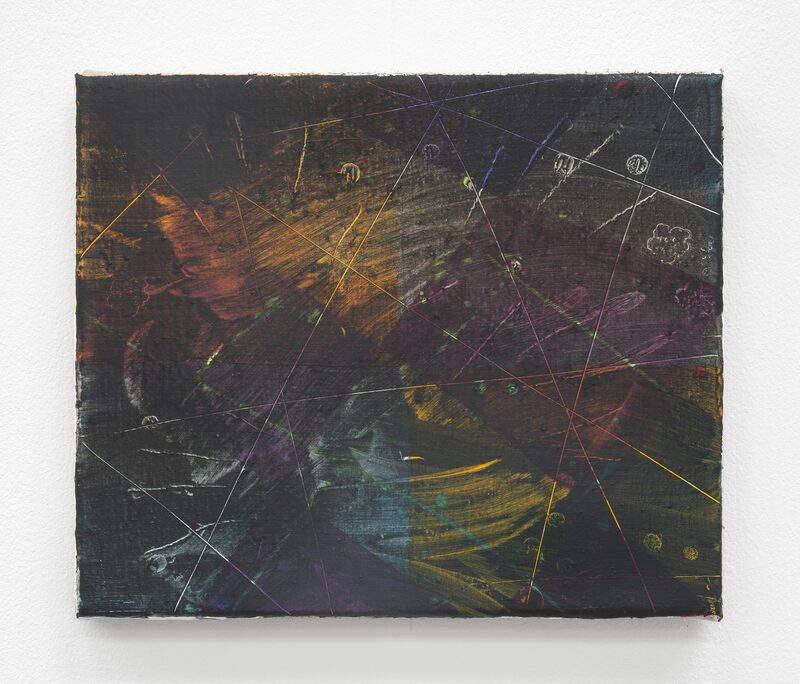 This seductive and subversive act brings the work closer to the body (the artist’s and viewer’s), lessening the gap between the painting and the world. 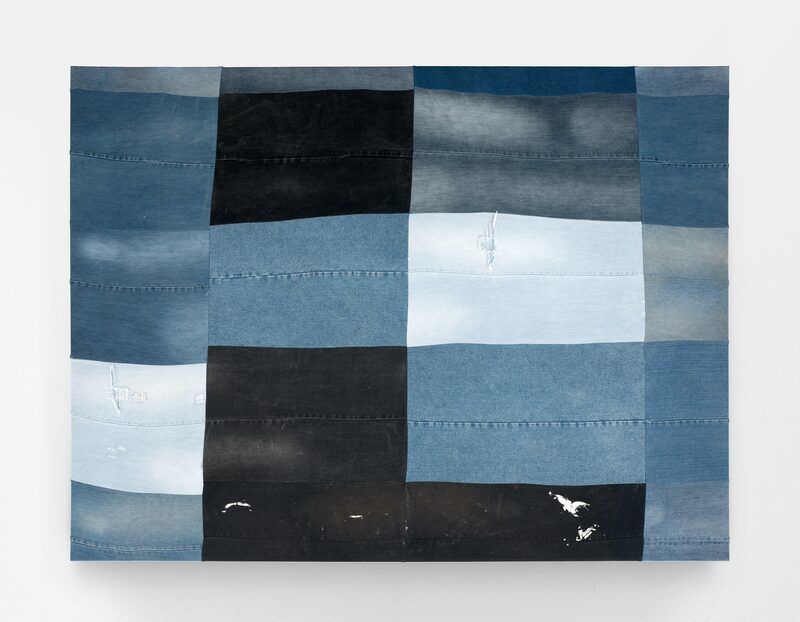 McIntyre’s patterning is indebted as much to painting’s history as it is to crafts such as weaving, pattern and quilt-making; acts intrinsically connected to the feminine, and to life outside the studio. 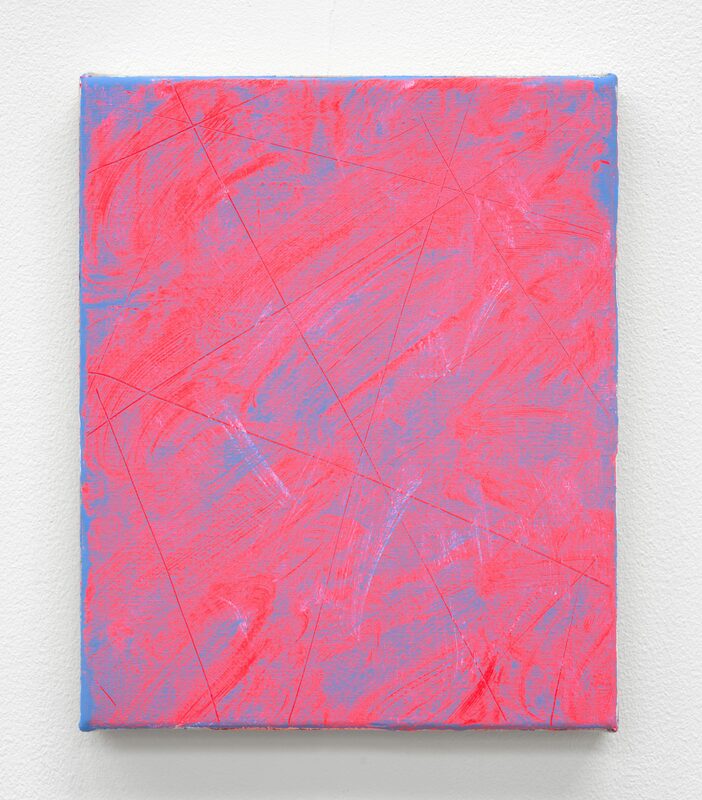 In Grid (veil) (2018), a slightly frilled mesh at the canvas edges reminds us of the materiality of this almost concealed layer. The nylon mesh recalls a veil or lace, with connotations of feminine modesty, even romance, but it is also like a surgical gauze, or net— something used to catch or hold together. Taken with the fingernails, and the floral stamps that punctuate some paintings, McIntyre’s work proposes the decorative in a way that is always bound up with the destructive. This sense of irreverence, or subversive play, pervades McIntyre’s practice. 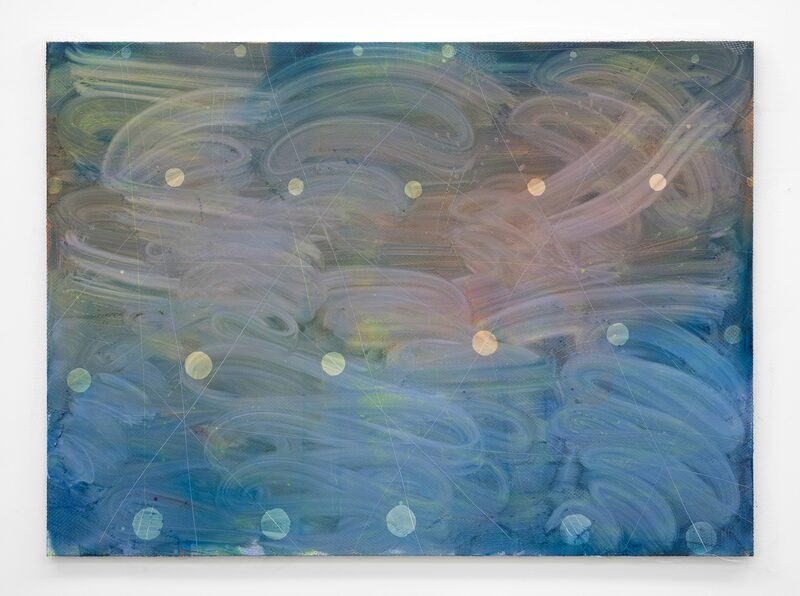 Using a range of mediums including flashe, a vinyl-based paint that interacts unpredictably with other materials, McIntyre often allows the alchemy of colour to occur intuitively. 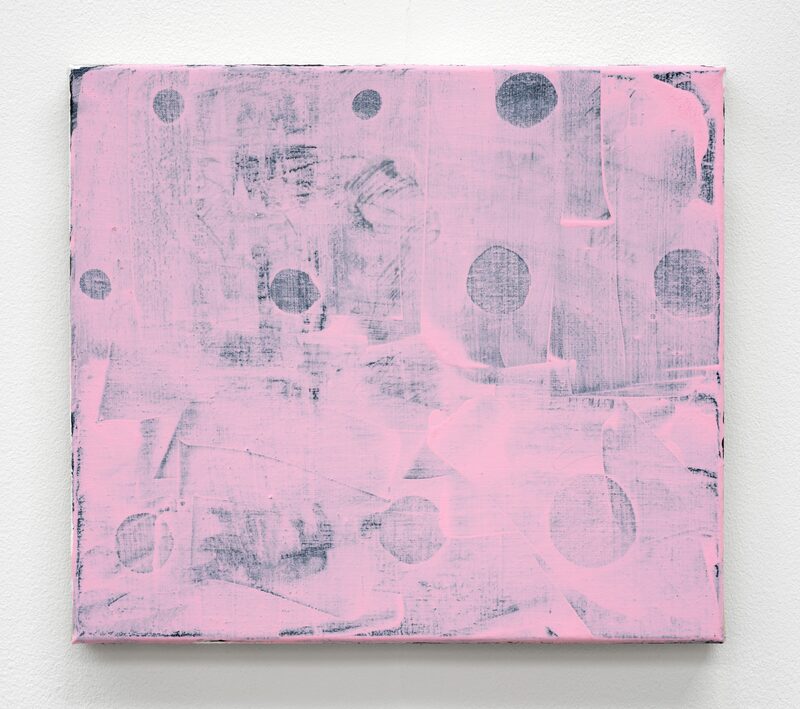 Light colours (often lilac or pale pink) of what would otherwise be an opaque medium are dragged across darker undercoats, big gestural swirls intensifying through re-iteration, their final form defined by the speed of the artist’s application. 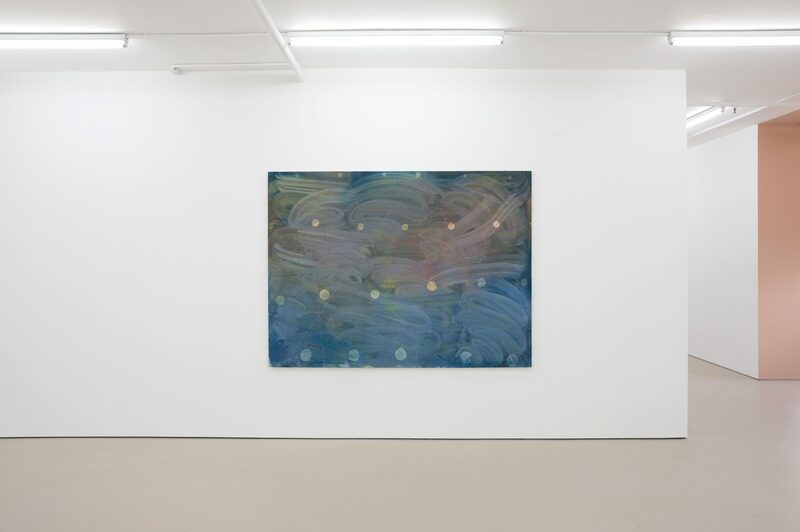 McIntyre’s luminescent paintings can be seen on one level as maps of her material experiments. 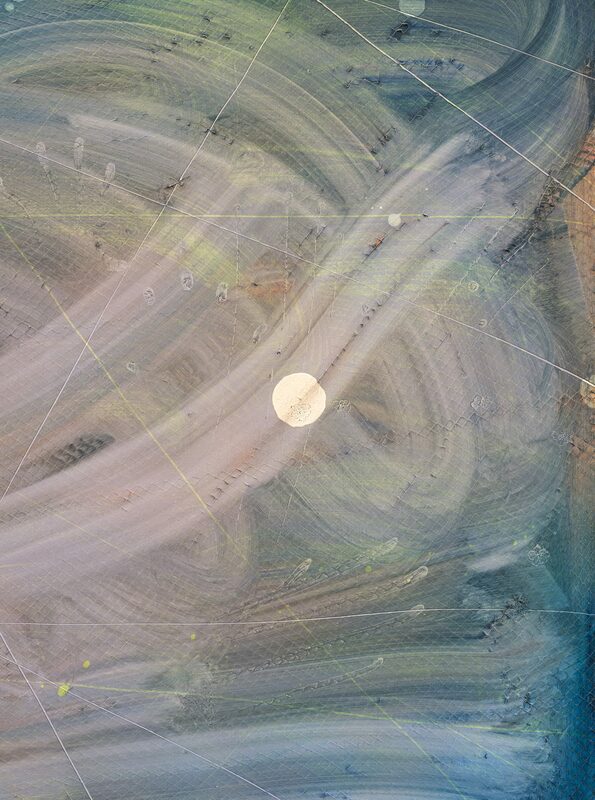 However, the way layers of paint work against one another, creating and flattening depth, evokes atmospheres on other scales (submarine environments, planetary bodies, meteoroid fragments, the microstructures of a cell cytoplasm), distant from but momentarily suspended in the canvas’s surface. Emma McIntyre (b. 1990, Auckland) graduated from with a BVA (Painting) from AUT University in 2011, and an MFA from Elam School of Fine Arts, University of Auckland, in 2016. 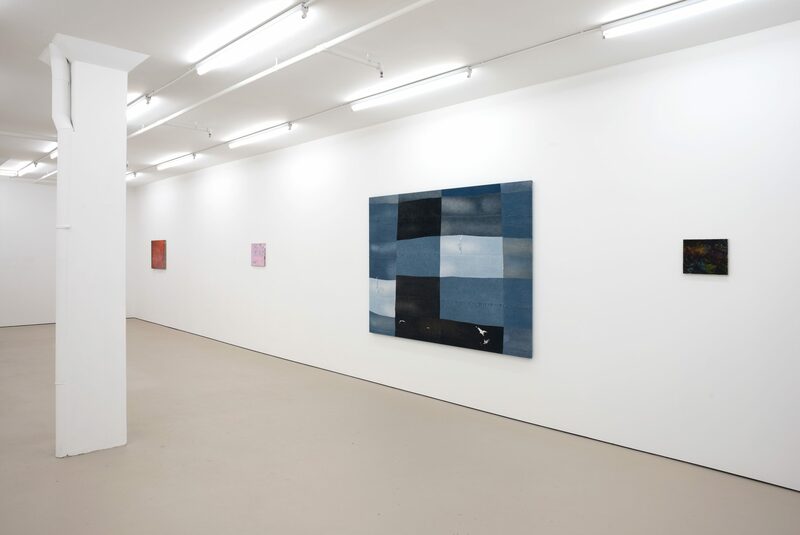 She has exhibited regularly at artist-run spaces since 2015, including in: A Trip to the Beach, Play_station, Wellington (2017); and Painting: A Transitive Space, ST Paul St Gallery Three, Auckland (2016). 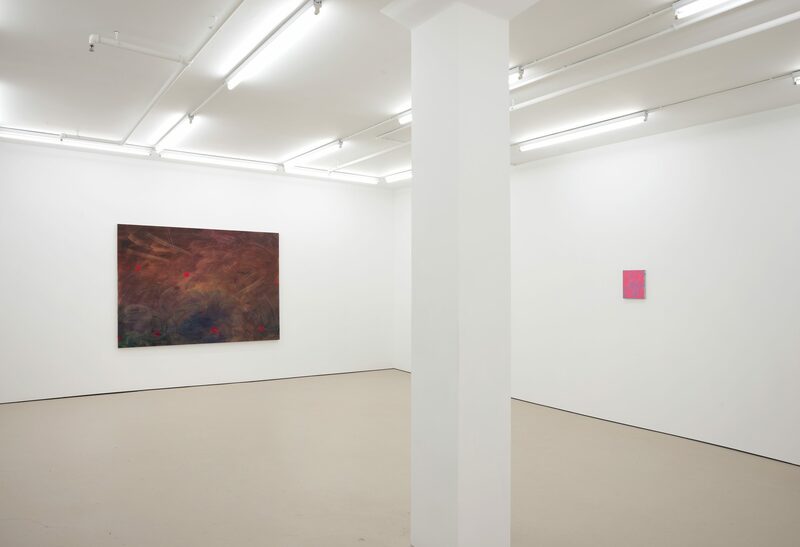 Rose on red is McIntyre’s second solo exhibition with Hopkinson Mossman, preceded by Pink Square Sways in 2017.
quote: Amy Sillman, ‘On Color’, in Painting Beyond Itself: the Medium in the Post-Medium Condition, 2016, pg. 105.